Neka is a small Siberian Husky whose name means “stubborn” in Swedish! She was rescued from a pound in Madison, Wisconsin when she was one year old in 2005. Neka had no idea how lucky she was to go home with Patti – who has more registered therapy animals than any other member of our organization and is dedicated to helping other teams train to become therapy teams as well. Her personality means it has taken her more time to settle and focus enough to go on therapy visits. However, now that she is ready, she’s participated in the “Paws for Finals” program at St. Olaf, a special “North to Alaska” program at a nursing home in Burnsville, and has also visited several times at another local nursing home. Patti says Neka absolutely loves people and the team also plans to visit at the VA Hospital in the future. 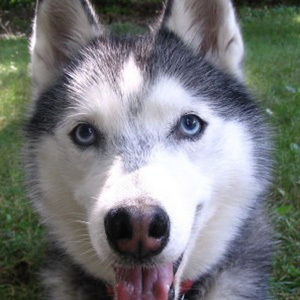 Neka is a fun dog who is full of energy and loves to skijor in the winter. Patti says Neka’s favorite movie is Disney’s “Eight Below”…she is a true snow dog and loves to spend her free winter time doing anything that has to do with snow!